Illinois State mock trial team co-captain Katie Campbell, on the witness stand as Haley. Illinois State senior Katie Campbell is an award-winning performer, but her stage isn’t a theater or in front of the camera. It’s a witness stand in a courthouse. As a member of Illinois State’s mock trial team, Campbell has spent months crafting the character of Haley Elizabeth Floyd, a quirky but stoic accountant who was robbed at knife point. Haley is called as a prosecution witness during the team’s competitions against other schools, and Campbell’s performance regularly wins individual awards from judges. To do it, Campbell puts on her big glasses, sticks pens in her hair, and channels the nerdy quirks of Mayim Bialik’s Amy Farrah Fowler character on the CBS show The Big Bang Theory. Campbell is now co-captain of the mock trial team, and under her leadership the team has grown into a national powerhouse. The team made it to the national finals last year for the first time, a milestone that earned Illinois State a spot in the prestigious Yale Invitational Tournament in the fall. Campbell, a senior English studies major with a minor in legal studies, says her involvement in mock trial has given her more confidence and bolstered her public speaking skills. But it’s also given the Hudson native a leg up as she prepares for the rigors of law school next fall. 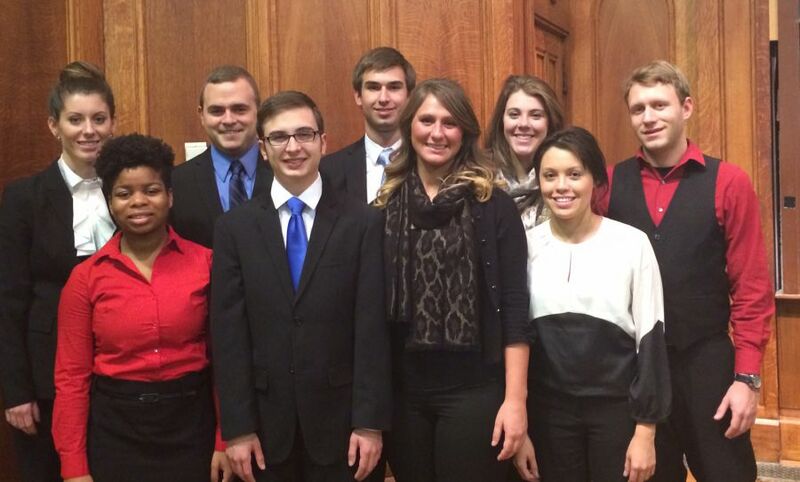 The nine members of Illinois State’s mock trial team at the Yale Invitational Tournament last fall. She joined mock trial in high school, partly to boost her extracurricular involvement so her parents would let her use the family car. Seven years later, she’s hooked. “I ended up absolutely falling in love with it,” said Campbell, who decided to attend Illinois State after being offered the Thomas Eimermann Scholarship for mock trial students. It’s a major time commitment. The nine team members easily spend 20 hours per week together preparing for the eight to 10 tournaments throughout the year, on top of any individual prep work. Together, the team dives into one case each academic year, something meaty enough that they litigate it against other schools over and over again. (This year’s case is a convoluted mess involving a violent end to a theft and robbery ring at a carnival.) At each tournament, Campbell’s team plays the prosecution and the defense twice, looking to score points based on their performances. The team recently took first place at a tournament in Joliet, and fourth place at a competition at Indiana University. Campbell has grown from a shy freshman to become a team leader, McClure said. At last year’s Pre-Law Annual Banquet, she received the Barry S. Tolchin Mock Trial Leadership Award, given to a team member who exhibited strong leadership skills and made significant contributions to team spirit and unity. Campbell’s witness, Haley, is also a winner. Campbell has won individual awards for outstanding performance at seven consecutive tournaments this season, with the heart of the season (including nationals) later this spring. Campbell expects her mock trial experience to come in handy during law school. During her recent law school visits, she sat in on an evidence class as students discussed hearsay and speculation. After law school, Campbell plans to pursue a career in divorce and child custody mediations, hoping to represent the best interest of children who are caught up in ugly disputes.